The latest albums of this Finnish long-time cult group prove them to be still going strong, especially the two parts to the operatic "Pisara ja Lammas" concept work. Musta Hiekka preceeded that masterpiece and is also a fairly strong Abso album, with some progginess among rather mainstreamy / indie-type pop-rock. The instrumental opener 'Kivi kuivuu' (=The stone dries) is gorgeous and suitably dramatic in a Science Fiction spirit. In the angular 'Veistän kehdolle kantta' (= I'm making a lid for a cradle) the vocals are made with a vocoder. And when Tommi Liimatta's vocals are finally heard properly, they're slightly more masculine than in the early output when they often approached normal speech. The 7-minute 'Valvoja-aika' is graced with a mighty guitar solo that leads to the general distortion of sound in a dramatic way. The next synth-based song resembles earlier pop-oriented material and may feel a bit boring to a prog-minded listener. (All in all, it can be said that AN's potential for international following is rather limited, and this is obviously reflected in the very small amount of PA reviews.) 'Teikäläisen taivas' a nice, powerful pop song full of clever rhymes; the poppiest output of CMX comes to my mind. The next track gives the emphasis on beautiful guitar textures. The slight sense of mystery and Science Fiction of the beginning is to some degree present on e.g. 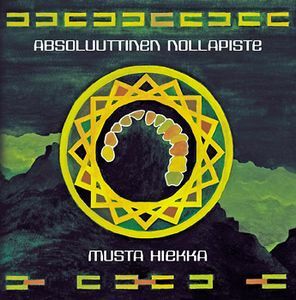 'Musta viisari', but the compositions get rather simple and vocal-oriented, turning the whole into a relatively typical AN album on the long run. I'm not yet so deeply into their output to say whether this is really among their best, but at least it contains some delightful freshness among the more-of-the-same feeling. Production is good all the way, and no doubt the lyrics offer a lot to think about, as always. Surely not a let-down album to a follower of this band. 3½ stars (rounded down due to the faint international prog appeal).